there's an official blue ribbon, does someone want to wear a brown ribbon? LOL ... and urinary cancers should have the yellow ribbon, although I think that's already been allocated to ovarian ... weird, huh? yes, yellow ribbon is most perfect for the badder bladder! amy your drawings are amazing. Keep em coming. Catharsis for me, and hopefully for you. I love love love the brown ribbon. shabby sheep from colon club. I would gladly wear a brown ribbon. You are one great cartoonist, honey! I love your sense of humor. A brown ribbon is pure genius---more power to you! 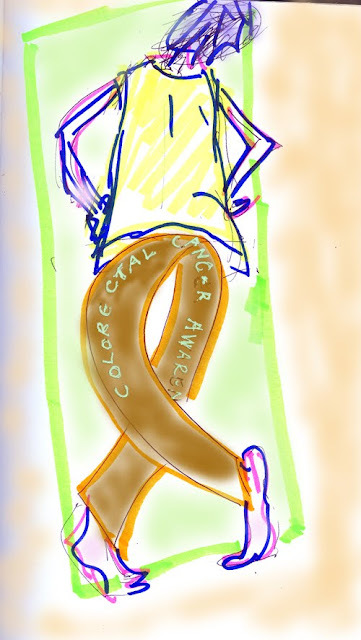 Those of us who have had colorectal issues in the family (my husband died 5 years ago of cancer emanating from his familial adenomatous polyposis) have no issue with the colour brown to show support. It's the people who don't like to think too closely about illness that may have a problem with it, in my experience. When I was first diagnosed I thought the blue ribbon was a missed opportunity. Brown seemed hilarious to me- and now that I found out it was I am tickled. Clearly I am not a majority with my weird humor- but I agree with Morag...we that have gone through this realize that the stigmas are silly, and in some cases, dangerous.